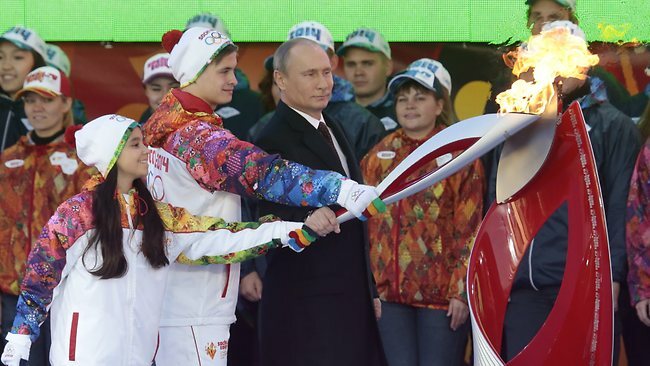 Vladimir Putin has taken part in a ceremony in Moscow to launch the torch relay for 2014 Winter Olympics in Sochi. The torch will go on a 123-day journey covering some 40,000 miles before the Games start in the Black Sea resort on February 7. The torch’s journey will include a trip into space. The Russian president said the Games would show his country’s “respect for equality and diversity”. The run-up to the Games has so far been marred by controversy over a new Russian law that restricts the spread of information about homosexuality, as well as allegations by rights groups that authorities have rounded up migrant workers who helped build the Games venues in Sochi. The Olympic flame had been flown in from Greece after being lit last Sunday at the birthplace of the ancient Games. Hoisting the flame in Moscow, Vladimir Putin declared in a ceremony shown live on television that “our shared dream is becoming reality”. Vladimir Putin said the Games would show “respect for equality and diversity – ideals that are so intertwined with the ideals of the Olympic movement itself”. He said the relay would show off Russia “the way that it is and the way we love it”. “Today is a joyous and momentous day,” Vladimir Putin said.